The Ogun State police command has arrested one Gbenga Ogunsanya for allegedly belonging to a deadly cult group.Speaking to newsmen yesterday when he was paraded alongside his gang by the Commissioner of Police, CP Ahmed Iliyasu, Ogunsanya revealed that they killed not less than nine persons in one year. The 22-year-old said he was initiated into the cult on May 30, 2017.The suspect, who is popularly called Spartacus, said he was initiated into the cult group because of his activities as a well-known tout in Abeokuta, the Ogun State capital. Ogunsanya was amongst the 48 suspected criminals who were paraded by the police at the command’s headquarters in Eleweran, Abeokuta.Iliyasu described the suspect as the most dangerous murderer and cultist who had been terrorising the metropolis before luck finally ran out on him. According to the CP, the suspect, who had been living a very rough life as a tout, became a gang leader within a very short time of joining the killer gang. Iliyasu said Ogunsanya, without any invitation, appeared at social functions with his men numbering about 30 and would start smashing vehicles and attacking people with axes. He was said to have killed another rival cultist named Lekan in Lafenwa area of Abeokuta because of a phone. Arrested with him, the police said, was another gang member, Quam Olubodun, one pump action gun, one cut-to-size locally made pistol, five live cartridges and some assorted charms. The suspect confessed to the crime, revealing that he had been in touting since the age of 17.He said he was a butcher in Lafenwa area of the state and that the people he met in the business changed his life to become a tout. 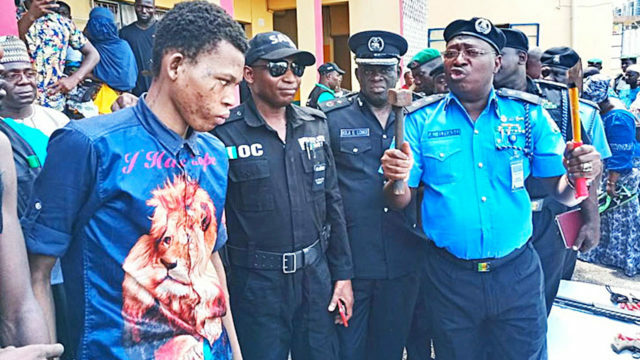 Also, a 27-year-old alleged cultist, Kayode Oreneye who killed another member of a rival cult group by severing his two palms was among the 48 criminal suspects paraded by the Ogun police command yesterday.Oreneye, an alleged member of the Eiye confraternity, was said to have trailed his victim, one Shakiru alias “school boy” from Abeokuta to Ilaro, where he killed him, severed his two palms and later sold same for N5,000 around February this year. The police boss disclosed that Oreneye was apprehended at a drinking joint in Abeokuta after attempting to shoot the security operatives to escape arrest.Meanwhile, the police have smashed a gang of suspected kidnappers, who killed one of the brains set to launch Nigeria into the new age of artificial intelligence. Police authorities told newsmen that 14 suspected kidnappers and armed robbers linked to the March 11, 2017 murder of Dr. Ibrahim Mailafia have been nabbed.It was tragic news for friends and family of the university don who was killed along Kaduna-Zaria-Kano Expressway on his return from the United Kingdom where he had just bagged a doctorate degree in artificial intelligence. Artificial Intelligence is the theory and development of computer systems able to perform tasks normally requiring human beings, such as visual perception, speech recognition, decision-making, and translation between languages. Mailafia was a senior lecturer with the Nasarawa State University Lafia. Detectives at the Inspector General of Police Intelligence Response Team (IRT) hinted that two AK47 rifles loaded with ammunition, a Barreta pistol and the victim’s iPhone handset were recovered from the gang.